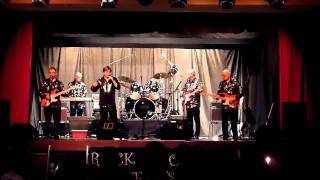 The Silver Shadows band was formed in February 2002, as a tribute to one of the greatest partnerships of all time – Cliff Richard and The Shadows. Each of our numbers is carefully crafted to match the original, distinctive sound. Our setlist also includes great songs and tunes from the ’60s, including our own versions of some of the numbers we want to keep alive for you. Have a look through the songs we play for more information. We are sure we would be a hit at events for all age groups. We love what we do! We’re hopelessly stuck on Cliff Richard and The Shadows, as well as the fabulous 50s and 60s. We support any enterprise that helps keep the music we love in the spotlight. Cliff, Hank, Bruce and The Shadows are still producing fabulous music today. So are other fantastic artists like Marty Wilde, The Searchers and others. Rock and Roll lives on. Long may it last! These web pages are intended to be fun, informative, and an easy link to The Silver Shadows’ music, history and upcoming gigs. Please contact us for more information about bookings, availability, etc.